The checkout process uses the existing Google Checkout system. 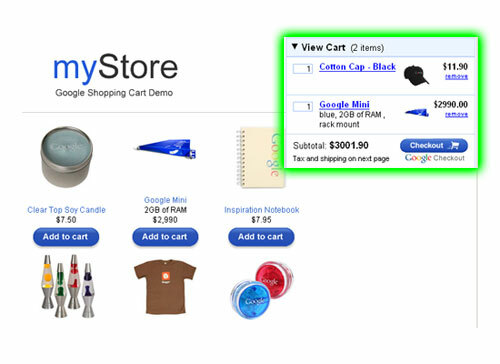 This cart looks to be an extremely easy way for websites to add shopping cart and payment functionality. It looks like it could be customized as much as a website would want, but seems to be a better fit for websites wanting to sell only a few items. I think that this could really help Google push their checkout service, as it has all but died since they gave up their free incentives.